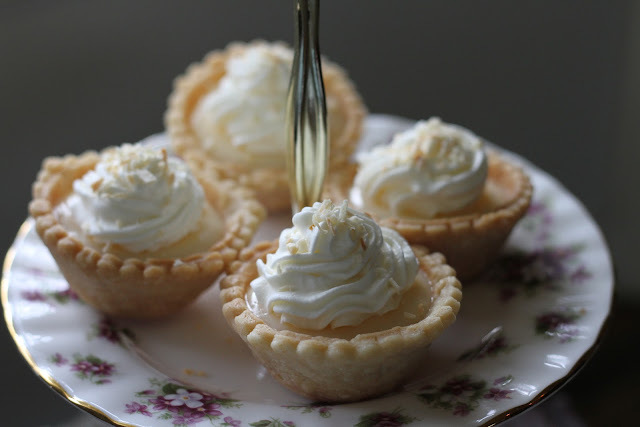 For my Saturday kitchen tip today I want to share these sweet little coconut tarts can come together in a few minutes if you have tart shells tucked into your freezer and a package of coconut pudding in your pantry. If you don't have time to make your own pastry you can use purchased tart shells. 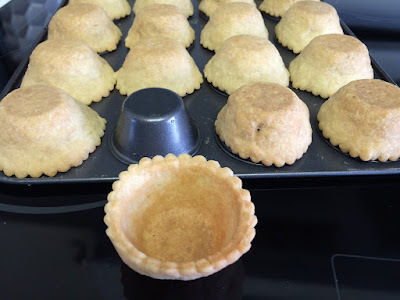 Simply remove the little foil tart pans and drape and shape them over your own upside down mini muffin pan as shown below. It's a quick little trick to keep your tarts a perfect size for filling. Use a 3 1/16 in / 78 mm cookie cutter, shape them over the back of a mini muffin pan and bake them. Allow them to cool completely before removing them to fill. Bake empty shells at 375 for about 10 minutes or until golden brown. Cook filling according to package directions or make Kathy's filling. Stir for 10 minutes to cool and to avoid a skin from forming on the top. Divide filling between tarts. Chill. Add whipping cream stabilizer or instant pudding, vanilla and sugar. Using a piping bag, garnish each tart and then sprinkle with toasted coconut. Best served the same day they are filled. The cream filling will soften the shells. 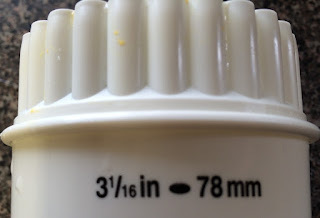 "Use a 3 1/6 in cookie cutter". looking forward to trying both - thanks a million. Oh I see my mistake now.. thank you! Sara, So nice to see a familiar blog/name pop up! Thank you for taking the moment to say Hi. All is well here and I hope it is for you too! Blessings! These look beautiful...and delicious! Thank you. What a clever tip for making perfect tart shells! Super smart. These look so lovely and sound absolutely delicious. Thanks for always giving us such great recipes.